If you're interested in why a command was removed or when it was first available, you can see every command from MS-DOS through Windows 8 or skip the details and see it all in our one-page table. Append The append command can be used by programs to open files in another directory as if they were located in the current directory. The append command is not available in 64-bit versions of Windows 7. At The at command is used to schedule commands and other programs to run at a specific date and time. Bdehdcfg The bdehdcfg command is ed to prepare a hard drive for BitLocker Drive Encryption. Bitsadmin The bitsadmin command is used to create, manage, and monitor download and upload jobs. 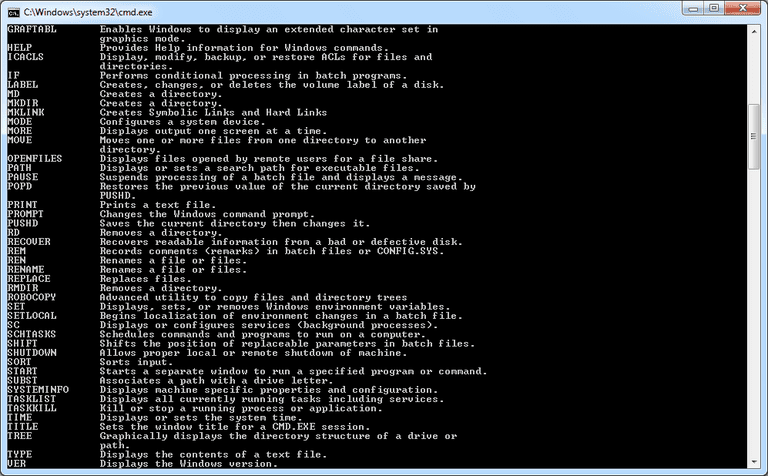 While the bitsadmin command is available in Windows 7, it is being phased out. The BITS PowerShell cmdlets should be used instead. Bootcfg The bootcfg command is used to build, modify, or view the contents of the boot.ini file, a hidden file that is used to identify in what folder, on which partition, and on which hard drive Windows is located. Bootcfg is available in Windows 7 but it serves no real value since boot.ini is not used in these operating systems. The bcdedit command should be used instead. Bootsect The bootsect command is used to configure the master boot code to one compatible with BOOTMGR (Windows 7) or NTLDR (Windows XP and earlier). The bootsect command is only from the Command Prompt available in System Recovery Options. Break The break command sets or clears extended CTRL+C checking on DOS systems. The break command is available in Windows 7 to provide compatibility with MS-DOS files but it has no effect in Windows itself. Command The command command starts a new instance of the command.com command interpreter. The command command is not available in 64-bit versions of Windows 7. Debug The debug command starts Debug, a command line application used to test and edit programs. The debug command is not available in 64-bit versions of Windows 7. Dosx The dosx command is used to start DOS Protected Mode Interface (DPMI), a special mode designed to give MS-DOS applications access to more than the normally allowed 640 KB. The dosx command is not available in 64-bit versions of Windows 7. The dosx command and DPMI is only available in Windows 7 to support older MS-DOS programs. Edit The edit command starts the MS-DOS Editor tool which is used to create and modify text files. The edit command is not available in 64-bit versions of Windows 7. Edlin The edlin command starts the Edlin tool which is used to create and modify text files from the command line. The edlin command is not available in 64-bit versions of Windows 7. Exe2bin The exe2bin command is used to convert a file of the EXE file type (executable file) to a binary file. The exe2bin command is not available in any 64-bit version of Windows 7. Fastopen The fastopen command is used to add a program's hard drive location to a special list stored in memory, potentially improving the program's launch time by removing the need for MS-DOS to locate the application on the drive. The fastopen command is not available in 64-bit versions of Windows 7. Fastopen is only available in Windows 7 to support older MS-DOS files. Graftabl The graftabl command is used to enable the ability of Windows to display an extended character set in graphics mode. The graftabl command is not available in 64-bit versions of Windows 7. Graphics The graphics command is used to load a program that can print graphics. The graphics command is not available in 64-bit versions of Windows 7. Kb16 The kb16 command is used to support MS-DOS files that need to configure a keyboard for a specific language. The kb16 command is not available in 64-bit versions of Windows 7. The kb16 command only exists to support older MS-DOS files. Loadfix The loadfix command is used to load the specified program in the first 64K of memory and then runs the program. The loadfix command is not available in 64-bit versions of Windows 7. Lpq The lpq command displays the status of a print queue on a computer running Line Printer Daemon (LPD). The lpq command is not available by default in Windows 7 but can be enabled by turning on the LPD Print Service and LPR Port Monitor features from Programs and Features in Control Panel. Lpr The lpr command is used to send a file to a computer running Line Printer Daemon (LPD). The lpr command is not available by default in Windows 7 but can be enabled by turning on the LPD Print Service and LPR Port Monitor features from Programs and Features in Control Panel. Mem The mem command shows information about used and free memory areas and programs that are currently loaded into memory in the MS-DOS subsystem. The mem command is not available in 64-bit versions of Windows 7. Mount The mount command is used to mount Network File System (NFS) network shares. The mount command is not available by default in Windows 7 but can be enabled by turning on the Services for NFS Windows feature from Programs and Features in Control Panel. Nfsadmin The nfsadmin command is used to manage Server for NFS or Client for NFS from the command line. The nfsadmin command is not available by default in Windows 7 but can be enabled by turning on the Services for NFS Windows feature from Programs and Features in Control Panel. The nfsadmin command is not available in Windows 8 because Service for UNIX (SFU) was discontinued. Nlsfunc The nlsfunc command is used to load information specific to a particular country or region. The nlsfunc command is not available in 64-bit versions of Windows 7. Nlsfunc is only available in Windows 7 to support older MS-DOS files. Rcp The rcp command is used to copy files between a Windows computer and a system running the rshd daemon. The rcp command is not available by default in Windows 7 but can be enabled by turning on the Subsystem for UNIX-based Applications Windows feature from Programs and Features in Control Panel and then installing the Utilities and SDK for UNIX-based Applications available here. Rdpsign The rdpsign command is used to sign a Remote Desktop Protocol (RDP) file. Robocopy The robocopy command is used to copy files and directories from one location to another. This command is also called Robust File Copy. The robocopy command is superior to both the copy command and the xcopy command because robocopy supports many more options. Rpcinfo The rpcinfo command makes a remote procedure call (RPC) to an RPC server and reports what it finds. The rpcinfo command is not available by default in Windows 7 but can be enabled by turning on the Services for NFS Windows feature from Programs and Features in Control Panel. Rsh The rsh command is used to run commands on remote computers running the rsh daemon. The rsh command is not available by default in Windows 7 but can be enabled by turning on the Subsystem for UNIX-based Applications Windows feature from Programs and Features in Control Panel and then installing the Utilities and SDK for UNIX-based Applications available here. Schtasks The schtasks command is used to schedule specified programs or commands to run at certain times. The schtasks command can be used to create, delete, query, change, run, and end scheduled tasks. Setver The setver command is used to set the MS-DOS version number that MS-DOS reports to a program. The setver command is not available in 64-bit versions of Windows 7. Shadow The shadow command is used to monitor another Remote Desktop Services session. Share The share command is used to install file locking and file sharing functions in MS-DOS. The share command is not available in 64-bit versions of Windows 7. Share is only available in Windows 7 to support older MS-DOS files. Showmount The showmount command is used to display information about NFS mounted file systems. The showmount command is not available by default in Windows 7 but can be enabled by turning on the Services for NFS Windows feature from Programs and Features in Control Panel. Takeown The takedown command is used to regain access to a file that an administrator was denied access to when reassigning ownership of the file. Tcmsetup The tcmsetup command is used to set up or disable the Telephony Application Programming Interface (TAPI) client. Telnet The telnet command is used to communicate with remote computers that use the Telnet protocol. The telnet command is not available by default in Windows 7 but can be enabled by turning on the Telnet Client Windows feature from Programs and Features in Control Panel. Tftp The tftp command is used to transfer files to and from a remote computer that's running the Trivial File Transfer Protocol (TFTP) service or daemon. The tftp command is not available by default in Windows 7 but can be enabled by turning on the TFTP Client Windows feature from Programs and Features in Control Panel. Tlntadmn The tlntadmn command is used to administer a local or remote computer running Telnet Server. The tlntadmn command is not available by default in Windows 7 but can be enabled by turning on the Telnet Server Windows feature from Programs and Features in Control Panel. Typeperf The typerperf command displays performance data in the Command Prompt window or writes the data to a specified log file. Umount The umount command is used to remove Network File System (NFS) mounted network shares. The umount command is not available by default in Windows 7 but can be enabled by turning on the Services for NFS Windows feature from Programs and Features in Control Panel. Vol The vol command shows the volume label and the serial number of a specified disk, assuming this information exists. Wbadmin The wbadmin command is used to start and stop backup jobs, display details about a previous backup, list the items within a backup, and report on the status of a currently running backup. Wecutil The wecutil command is used to manage subscriptions to events that are forwarded from WS-Management supported computers. If you're interested, we also keep operating specific lists, which you can find in these Windows 8 commands, Windows Vista commands, Windows XP commands, and MS-DOS commands documents.